This little bit of copper could save your life. It’s called a “ground strap” and hopefully you have something like it somewhere in your home. 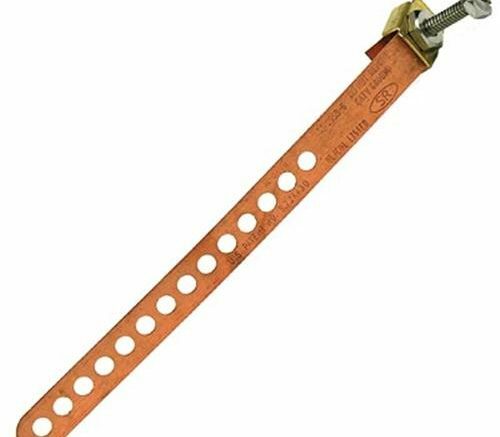 A ground strap is used to secure a grounding wire to something that connects with the actual earth, like a cold water pipe. It works simply: connect a ground block to your coaxial cables, or simply run ground wire from the green screw on any equipment that has one. Connect one end of the ground wire to the ground block or equipment, and the other end to this ground strap. Tightly connect the ground strap to a cold water pipe that goes underground. There may be a little more to it depending on local ordinances, but if you’ve done those things then you’ve successfully protected your home against fire in one of the easiest ways possible. Look, I’m not going to tell you that your house will survive a lightning strike completely unharmed if you run this little green wire from here to here. Lightning is really, really powerful and realistically it would probably melt the wire if the house got struck with a nice solid bolt of the stuff. But short of a full-on sky attack, proper grounding will help everything in your home stay unburnt and safe. That includes your possessions, your electronics, and most of all you. Without proper grounding, any stray electricity that is attracted to your antenna, satellite dish, or any piece of metal up there for any reason… goes straight into your home’s wiring. The copper cables in your walls may survive the jolt, but your equipment won’t, and more importantly the immediate increase in heat that you’ll see could light your walls on fire instantly. That could lead to a big mess, let’s be honest. If you don’t know where your ground strap is, it’s possible you don’t have one. If you can’t see a green wire coming down from your satellite dish or antenna, maybe there isn’t one. You’re in danger, let’s make that perfectly clear. Now is the time to act. Just a few dollars spent on some copper and connectors could make the difference between a blown circuit breaker and a burned-down house. That’s worth taking a few minutes to think about, isn’t it? Of course, you might be thinking, “where oh where can I get all the supplies I’ll need to do these grounding projects right…” and the answer, as always, is simple: visit your friends at Solid Signal for the best selection of grounding supplies at the best prices. You’ll be glad you did.